I have always assumed that "them" in the scripture refers to "seer," and that is probably correct. Grammatically, however, "them" more logically refers to "things which are past" and "things which are to come." Now that set me to musing. Given the seer's role in correctly interpreting the past and future, I don't think my musings are entirely inappropriate. That said, with all due apologies to seers living and dead, I'm not going to chat much about them today. Instead, I have been thinking in more basic and personal terms about the importance of viewing the present through the corrective lenses of the past and the future. 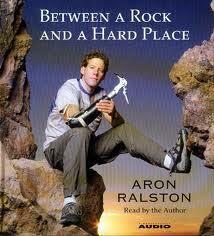 Aron Ralston's vision of things which are to come changed his view of his present circumstances, pushed him beyond his own natural capabilities. We may never have to saw away at our own arms to save our lives, but we do have opportunities in life to endure daunting trials, or even to relinquish an arm of sin, if you will. Our vision of the future, be it an eternity with loved ones or a more immediate promise of desired blessings, can give us the perspective shift we need to press forward. Likewise, a thoughtful examination of the past (in contrast with an obsessive dwelling on remembered offenses or triumphs) can also unearth hidden pearls of wisdom applicable to present trials or conundrums. Some time ago, I received what felt like an inspiration or a premonition. It was an odd premonition, and my first inclination led me to discount it. But the feeling persisted, forcing my closer examination. I remembered other instances of inspiration and began to recognize a pattern in how the Lord communicates with me. Those patterns of the past teach me how to respond when the Lord presents me with puzzle pieces, and they guide my hand as I work to find the picture in the pieces. True to lessons learned in high school English and popular culture, I subscribe to the philosophy of carpe diem.We do need to focus on today and live our present as wisely and as richly as possible. At the same time, our past and our future make that possible, strengthening our hand as we strive to seize the moment for all its glory. I needed that. Thank you. I have been trying to go into "No!" mode but am still failing. I need to sieze the moment, or in my case, the right moment.